CWL --- Walking Gettysburg's Battlefield: Civil War Minutes, Volume 3, Parts 1 & 2. 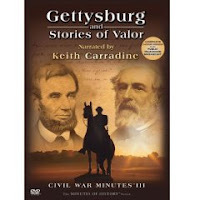 Gettysburg and Stories of Valor: Civil War Minutes Volume 3, Parts 1 & 2, writers: Michael Kraus, David Neville, director Michael Bussler, Inecom Entertainment Company, 90 minutes, 2004. Inecom Entertainment Company is among the best small, independent producers of history documentaries. In terms of direction, content, writing, and production, I would pick an Inecom product over all others, including the History Channel. This pair of dvds is full of informative, but unpadded, and interesting, but unexaggerated, stories. The writers know the difference between trivia and obscure information. Trivia is humorous and superficial; obscure information is insightful and illustrates a larger truth. Part 1 of the set offers 14 topics on Gettysburg and part 2 sets forth 16 stories of the Civil War. Biographies and material culture, behavior and events are dual themes throughout Volume 3. Interested in Civil War era medicine? On disk 2, there are short features about caring for the wounded, bullet wounds, and amputees. Looking for background on generals? On both disks there are stories of Winfield S. Hancock, Lewis Aristead, Alexander Hays and Felix Zollicoffer. Haven't heard from Civil War era civilians recently? Meet John Burns of Gettysburg, and the men, women and children of Pittsburgh's Allegheny Arsenal who died on the afternoon of September 17, 1862. Take a look at one of the farmsteads that became a burial site for hundreds of Confederate dead at Gettysburg, the Forney farm. Explore Gettysburg's historic photographs that are faked. Walk through both the Evergreen and the National Cemteries on Cemetery Hill, Gettysburg. You'll find Confederates buried in the National Cemetery and the actual location of the podium for the Gettysburg Address in the Evergreen Cemetery. The writers and director tell the stories of the men who carried the weapons by focusing on their material culture . Examine the path of shrapnel through a CSA major's coat sleeve. Carry a drum across the Emmitsburg Road, lose it and have it returned 20 years later. Go through the haverack and knapsack of a soldier. Cross the Dead Line at Andersonville; live in POW camps in the North. Thankfully, reenactors are not in every shot; they are limited in their appearance to closeups as they handle their guns, bone saws, haversacks, and drums. Don't get me wrong; I am a reenactor and appreciate the 'living history aspect' of the hobby. But to show reenactors running through woods, up hills and across streams, ad nausem like the History Channel or MediaMagic frequently do, usually covers bad writing and unsupported generalizations. The writers and directors show the actual implements of war as they are preserved in private and public collections throughout the country. The credits that run at the end of each disk will answer the question you will probably ask several times during your viewing of Civil War Minutes; "Where did they find that?" Civil War Minutes, Volume 3, Gettysburg and Stories of Valor, is recommended for all ages and all levels of interest in the Civil War. Reluctant Protestant Confederates: The Religious Roots of Condititional Unionism, Charles F. Irons, in Virginia's Civil War, Wallenstein and Wyatt-Brown, eds., Univesity of Virginia Press, 2005, pp. 72-86. Many Episcopal Methodist Virginians willingly remained in fellowship anti-slavery congregants in the Baltimore Conference, even through October 1859 as John Brown raided Harper's Ferry. 'Did the Deep South's greater material interest in slavery compel the churgoers of this region to read the Bible differently and to reach different conclusions' about the secession?' Yes. Gettysburg Battlewalks: Culp's Hill, Hartwig, Scott, Pennsylvania Cable Network, 1 hour 31 minutes, 2003. This tour is a testament to Scott Hartwig's ability to hold a story together for 100+ walkers. 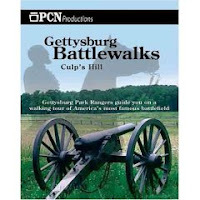 For the armchair viewer, this particular dvd in the Gettysburg Battlewalk series, has no vistas, no panoramic views, and no closeups of monuments. Its trees, trees, trees and trees. Viewers would do well to just listen to parts of this battlewalk while consulting any combination of the following materials: the McElfresh watercolor map, Pfanz's 'Gettysburg: Culp's Hill and Cemetery Hill, the West Point Atlas of the Civil War, Hartwig's guide to battlefield monuments and Archer's tourbook, Culp's Hill at Gettysburg: The Mountain Trembled. Hartwig introduces the Culp's Hill battle as 'not a happy one.' He views it as one of defeat, tragedy, courage, mediocre generalship and the advantage of a hilltop position with breastworks. Key elements of the story are Slocum's decision to leave one brigade on Culp's Hill after being ordered to remove the entire 12th Corps, Greene's decision to order his brigade to build breastworks, and the loss of command and control of troops by Confederate generals. Hartwig states that among the causes of this loss is the physical distance between Lee's headquarters and Ewell's headquarters with the town between them, the terrain over which CSA troops fought, and the lack of understanding of the topography of the Culp's Hill battlefield. Hartwig also sees Lee's orders to Longstreet on July 2nd and 3rd as they relate to Lee's orders to Ewell on July 2nd and 3rd as creating the loss of control by Lee of his army corps attack schedule. This particular loss by Lee puts Ewell at a disadvantage. While Ewell's corps is fighting, no other CSA troops are attacking. Hartwig amply presents soldiers' words to describe the ferocity of the battle. The active listener will take notes on the chronology of the events because much of the ground is fought over twice. The tour goes halfway up to the summit, then down, up to the lower summit, then down, over to the edge of Pardee's field, then back to base of the the summit, then up to the top, then down to the bottom again. The actual tour took between 2.5 to 3 hours; the dvd contains 1.5 hours of lecture material. This battlewalk is recommended to those who have a well stocked library and have visited the Culp's Hill site at least once. 'Meteor of the War': Melville, Thoreau, and Whitman Respond to John Brown, Ljungquist, Kent, American Literature, 61:4 9 (December 1989), 674-680. Within The Portent, Melville uses several images: meteors harkening uncommon events, weirdness recalling the three Weird Sisters of Macbeth who are fate's instruments, and the veil covering faces of blind seers in classical tragedy. These three descriptions of John Brown 'underscore his prophetic role in the conflict about to consume the nation.' (674) Between October 16th and December 2 1859, meteor showers were widely covered in the newspapers of New England; on October 16th Brown began his assault and on December 2nd, he was hung. In a poem, Year of Meteors, Walt Whitman describes Brown's unhealed wounds while he climbs the scaffold. Whitman inserts himself into the poem by using the noun 'I' and asks 'What am I myself but one of your meteors?' (679-680) Most of the Northern and Southern press did not accept the view of Whitman, Melville and Thoreau and Emerson. In general newspapers declared Brown a fanatic or an insane man. 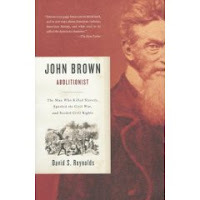 The best comprehensive treatment of Brown's life, and several historian's treament of it, is David Reynold's John Brown, Abolitionist. Reynold's begins his book with a question. Why have historians for the past 150 years viewed Brown as insane and treat him dismissively? The Dilemma of Quaker Pacificism in a Slaveholding Republic, 1833-1865, Jordan, Ryan, Civil War History, 53:1 (2007), 5-28. During the Antebellum Era, The Society of Friends numbered slightly over 200,000. Possessing a variety of theological views within their community of Meetings, Quakers all agreed upon two tenents. They rejected human government and they embraced pacificism. The potential of anarchy was balanced by the fact that they would not violently overthrow government. The Quaker church was the first to disallow slaveholding among its members. As an organization, it formed the spine of the abolition movement though slaveholding among Quakers did not disappear overnight. Southern Friends gradually emancipated their slaves over decades and well into the 19th century. Would the Quakers disobey the state and participate in the Underground Railroad? Would the Quakers obey the state and support the Union war effort? Would the Quakers embrace those Quakers who joined the Union army before the Emancipation Proclamation? Afterward? There were those among the Society of Friends who rejected abolitionism since the Friends should not overthrow a government even though they could not consciously support the government. There were others who, by the 1830s, accepted the proposition of immediate abolition, with the abolition movement in England providing an example. A few Quakers proposed colonization of freed slaves and other sreject colonization due to the possible imposition of the horrors of the Middle Passage upon those returning to Africa. Slavery was recognized a great humnitarian wrong but what behavior constitutes pacifistic resistence to this particular institutionalized evil? Immediate abolition and colonization were poloarizing issues that threatened to break the communion of Quaker saints. Additionally, Quakers debated whether non-violent resistence could be implemented with violent consequences, particularly in the South. The solutions offered by Levi Coffin, Quaker and Underground Railroad activist, and the Indiana Friends were polar opposites. Coffin would in all circumstances assist runaway slaves; the Indiana Society of Quakers asserted that in all circumstances they would not assist runaway slaves. 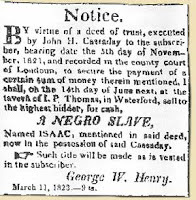 Castner Hanaway, a Christiana, Pennsylvania Quaker was arrested and charged with treason for inciting runaway slaves to resist slave catchers. Generally, Quakers held to the notion that righteous ends should be sought through righteous means. Quaker settlers in Kansas were attacked and their missionary schools for Shawneees were burned. In Virginia, during a 1859 meeting, a Quaker minister spoke out against Abolitionists and was shout down by female who quoted scripture to the minister, likening him to the Scribes and Pharisees who acted hypocritically and who were confronted by Jesus. Confronted by violent slaveholders backed by a violent government, some Quakers dispensed with pacificism and employed violence as a means of self-defense. An unknown number of Quakers supported John Brown while he lived in Kansas and when he moved back to New York. Two men raised in the Quaker tradition, set pacificism aside and joined Brown for the Harper's Ferry Raid. Barclay Coppoc died during the October fight; Edwin Coppoc was executed by the state of Virginia for treason and insurrection. Levi Coffin believed that Providence would use the violence of John Brown for Providence's own end, emancipation. Quakers in the Union army understood resistence to the rebellion of the South as being similiar to the resistence of the angels to Lucifer, who was an angel lead a revolt in Heaven. Recent detective work has revealed that 25% of the eligible Quaker men in Indiana served in Union armies; a second historian revealed that the number of Quaker soldiers from Indiana may have reached 66% during the war. Other studies show that most Quakers voters in the 1860 election cast Republican ballots. The violent resistance of Southerners to moral suasion of the Friends created a dilemma. Understanding life and religion to be integrated, the Quakers allowed for freedom of conscience within their meetings. Some embraced the state sanctioned violence of war; others embraced the kingdom sanctioned mercy towards the freedmen. It appears that Quakers did not condemn Quakers for exercising individual consciences and walking the path the Providence had set before them, individually. CWL --- A Poor Man's Fight in 1863? Not So! But Maybe? Tyler Anbinder, Civil War History, 52:4, 344-372, 2006. George Washington University professor of history, author of 'Five Points: The 19th Century Neighborhood . . .,' and contributor to the History Channel regarding the film 'Gangs of New York,' Tyler Anbinder breaks a myth of the 1863 Northern draft and NYC riots of July 1863. Myth: The rioters' fear that they would be disporportionately affected by the draft caused the civil disturbance. The fear was well founded. 17 years of age or younger, 45 years of age or older and single, 35 years of age or older and married, only son of a widow or infirm parents, father of a motherless child, two or more brothers in the federal armed services before March 3, 1863, and a variety of physical ailments. Those included sensitive feet, crooked toes, hernia, excessive stammering, inflamed testicles, and imbecility among others. Of all those who reported for the draft 40% were exempted for medical reasons. The 60% who reported for the draft and had no physical excuse had three choices: serve in the military, hire a substitute, pay the commutation fee of $300. This fee was applicable until the next draft. At that time another commuation fee would have to be paid if a substitute was not purchased and the draftee, the second time around, did not want to serve. 'Immigrants, it turns out, had far more agency in controlling their draft fate than most observers--both then and now--have imagined." They could claim exemption by not supplying court documents regarding their application for citizenship. Immigrants that were in the process of receiving citizenship were eligible for the draft. Very few immigrants were forced into the military during the 1863 draft; but, about half the soldiers who entered the armed forces as a result of the 1863 draft were immigrants. Primarily, these immigrants enlisted as substitutes. So were the immigrants forced into military service? In most cases, no, not in 1863. So did the immigrants choose to join the military service due to monetary incentives? In most cases, yes, in 1863. So which nationality were these immigrants who choose to join the military service for money? In most cases, Irish, in 1863. So were the immigrants, who choose military service because of economic incentives, poor. In most cases, probably, I think. I've read Anbinder's 'Five Points: . . . " and if the immigrant was living in NYC and was Irish, than more times than not, that immigrant was economically disadvantaged. 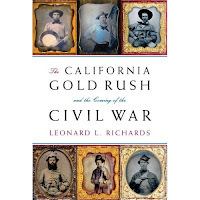 The California Gold Rush and the Coming of the Civil War, Richards, Leonard L., Knopf Publishing, 304 pp., illus., maps, 2007. Gold Rush! California, like Kansas in the 1850s, was caught between pro- and anti-slavery settlers. To migrating Southerners, the labor-intensive mines in the Sierra Nevada Mountains begged for slave labor. Southern slave holders, who did not migrate to California, viewed Californaia as a new market for slaves. The Mexican state of California became the U.S. state of California through intense political maneuvering, timely military presence, and impassioned hypocritical rhetoric. A 'free state' (wage labor as opposed to slave labor) California narrowly missed being divided, north to south, wage labor and slave labor. Conversely, Northern migrants envisioned the building of ports which in turn would lead to extensive participation in the China trade. The struggle for California statehood, the divisions within the Democratic Party, the contentious spirit of the American (Know Nothing) Party, the demise of the Whig Party, and the explosive growth of the Republican Party is subperbly described by the author. Slanders, duels, law suits, graft, were a frequent occurrence. In an era when voters received paper ballots at home and then went to the polls, party organization was essential. The author offers telling details within in the mural of the political, social and economic panorama of California. Richards opens the story with the murder of an Irish Catholic Democratic U.S. Senator and ends the book with the unmourned death of one of the conspirators 20 years later. In the middle of the work, Richards reveals that the senator predicted his own death within a next few months. Seamlessly moving from the Sierra Nevada goldfields to San Fransico, from Panama and to the halls of Congress, and then back again, Professor Richards tells a story of gold and railroads, Mexicans and Anglos, miners and politicians, frontier women and ballroom damsels. Refreshingly, Richards draws his conclusions hestitantly. He offers no platitudes nor does he reveal an agenda. The reader draws his own conclusions and meanings regarding the Slave Power Conspiracy, Stephen Douglas' quest for a railroad for the West, James Buchanan's activism and paralysis, and John Fremont's reputation and his actual accomplishments. This reader realized how close California was to becoming North California and South California. How may have the Civil War turned out if the North had not received almost $3 million dollars a month during the Civil War from the California gold fields? How may have the war turned out if gold had been king and cotton had been queen of the South?